On a bit of a crawl in this area, popped in here for one. Abbott at 2.20 a pint within 150 yards of Oxford Street ! The need to keep to the schedule meant we just had the one, but I will be returning. 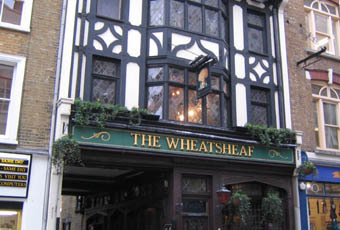 This is a good pub to remember if you're looking for a quiet drink within a short distance of Oxford Street and Tottenham Court Road. It looks as though it hasn't changed much for many years and it does have a lot of history and character in a shabby chic kind of way, with its unusual layout, wood panelling, stained glass windows and its associations with old literary figures. 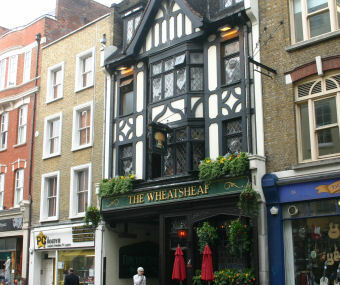 It’s a little gloomy but the Wheatsheaf Ale was fine and the barmaid was friendly and attentive. Recommended. Not a bad pub at all. Plenty of room to sit, good selection of beers, efficient/friendly staff. Long and narrow on the inside although the fittings are perfectly nice. Very good pub in an area filled with very bland pubs. It is unpretentious and has retained some character - the upstairs room is all wooden panels and stained glass. They keep a couple of decent beers too. Well worth a visit to get away from the mayhem of Tottenham Court Road and Oxford Street. This is the kind of dull pub that the world will not miss if/when it closes. There is literally nothing remarkable about this pub. How can people say this place has character? Complete nonsense. Generic shell which offered 2 ales on my visit, Adnams Bitter and Spitfire. My Spitfire was fine, no complaints here, but there was no reason to stay for another. Not one to seek out.